During my tenure as the 2017–18 Price Lab/PennSound fellow, I have had the opportunity to peruse the many MP3 files in the PennSound archive and to consider what inferences and conclusions can be drawn from the relationships between sound, excess, and discard. Discard may seem an unlikely object when staged in relation to sound and, in particular, to the special sonic registers we associate with an audio recording of poetry. After all, in common parlance we don’t usually think of, or describe, spoken poetry as having a discardable or distant materiality that persists after it is uttered. The speech act cannot be called back. ‘Throwing the voice’ is perhaps the closest example to the ejection or dislocation that the word ‘discard’ seems to imply, but this submerged metaphor primarily refers to a distancing effect whereby speakers project their voice to sound as if they’re coming from another direction, place, or person (as in the case of ventriloquism). This kind of distancing effect is not my focus here although the idea of excess and disconnection it might produce certainly is. Arguably, the audio file and the audio archive, such as PennSound, make the ‘sonic discard’ or the ‘sonic surplus’ more explicit. What do we include or exclude in a digital archive? Should archivists retain a speaker’s hesitations, their stutters, ‘ums,’ ‘ahs,’ and ‘yeahs’ that vocalize their churning thought processes? Managing the curatorial economy of an archive assumes that something has to be edited and/or excluded, although it’s not always clear what undergirds the logic of these exclusions. Certainly not everything can be retained, lest the archive becomes a collection of undifferentiated materials like a landfill or even the World Wide Web. One of the curatorial features of PennSound is its segmentation of files, where a poetry reading is sliced into individual poems. The advantage of this system is that it allows for close and comparative listening to different recordings of the same poem, but the practice of segmentation also requires that we understand what might constitute the parameters of the speech act. Since the poem may be framed by prefatory remarks, the poem itself becomes a porous object. Much of my research to date has in fact interrogated the everyday, unintended, excessive, and peripheral materials of the poem, ranging from found language, textual and sonic collage, and, in the case of audio files, the prefatory remarks that frequently precede the reading of the poem and the poetry reading itself. From both a discard and sound studies point of view, then, my work reconsiders the objects of my inquiry — the paraphonotexts — as peripheral, yet critical, cultural data that illuminates the artificial environment of both the reading venue and the reading space. Here, I borrow Al Filreis’s definition of the paraphonotext that includes both the intended prefatory remarks and unintended vocalizations that accompany the reading of a poem. Daisy Atterbury’s introduction to Rachel Blau DuPlessis’s reading at the Zinc Bar, in New York City, for the Segue Series on October 3, 2013, marvelously exemplifies the kind of critical force that a paraphonotext can produce. Atterbury’s epistolary address to DuPlessis touches on the gendered, sexual, and literary desires circulating in the latter’s oeuvre. In the context of PennSound’s author and series pages, Atterbury’s letter is framed as a prefatory remark since it’s not currently segmented from DuPlessis’s reading. Yet, if Atterbury had her own author page on PennSound, I wonder if this letter ought to be segmented and included on it. Certainly, it seems clear that Atterbury’s address to DuPlessis destabilizes the borders between preface and the main event, the introducer and the poet, since it produced a delighted reaction in Rachel Blau DuPlessis when she finally took the stage. At any rate, such instances invite us not only to underscore the unique performances of the paraphonotextual object but also to reassess what we consider is the principal ‘event’ in a poetry reading. The introductory remarks to a reading or a poem considerably drives the bulk of my sound studies research, but I will hold off reporting the extent of my findings here as it requires a longer response than I can reasonably devote, although I’ll offer some rudimentary observations later. Suffice to say, I begin with this preamble to my ramble in order to signal my interest in sound, everydayness, surplus management, and the extended preface in the PennSound archive. 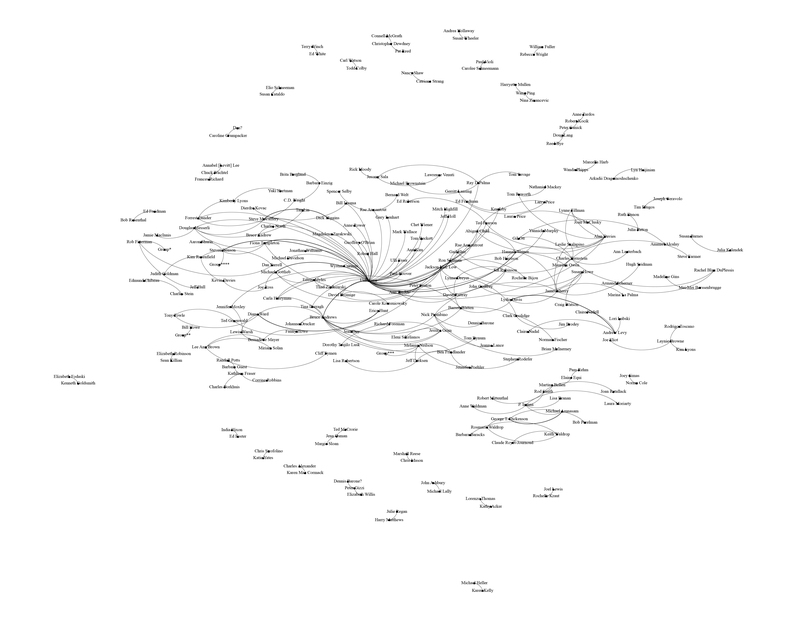 Since both discard and sound studies demand that we include the agentic social actor in relation to production, I became curious as to what inferences we could draw from who populates the reading series and what networks might exist between these actors. I had hoped that this question would lead me to better appreciate the conventions of the reading series since I don’t believe this form of event is always self-evident when we take into consideration pop-up, one-off, or intermittent readings. After all, how do we know if we see or find this object in an archive? What kind of institutional parameters are needed for a series to persist and become mobile? Is a series inextricability connected to the site or venue of the reading? From this interrogative cluster, a larger question then loomed: what is the difference between site and space, place and environment? My humanities training has focused on these questions. My nascent digital humanities (DH) training has settled on something far simpler: who reads with whom? A combination of both approaches has helped to consolidate the trajectories of these variegated inquiries. 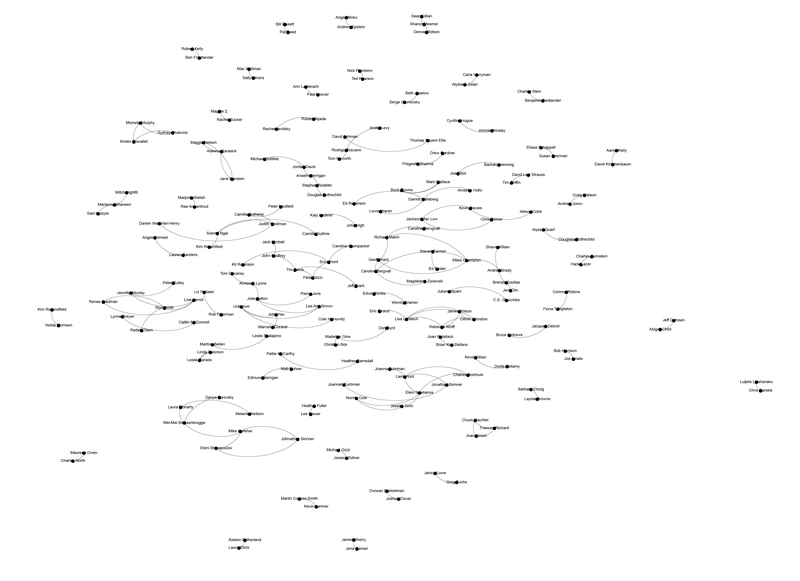 What follows then is a very condensed, prefatory response to the question: can we identify patterns of poet networks in a particular reading series? Consider this response as a proof-of-concept for a humanities scholar, who is learning how to grapple with a set of digital tools that can help ask new questions (and test the critical strength of old ones). I anticipate that this initial inquiry will bloom into larger, more robust exploration into the artificial environments of the reading series (in the plural sense) and the way that sound, discard, and ecology are deeply interconnected in the digital archive. I settled on the Segue poetry reading series as my primary object as I suspect that it is one of the longest running poetry series on the East Coast, and quite possibly in the United States. Although incomplete, PennSound does hold a substantial number of the series’ recordings thanks in part to the curatorial efforts of Charles Bernstein. The Segue Foundation, founded by James Sherry, which hosts the series, has been an important presence in New York City’s experimental literary culture since 1977. Between October 1976 and December 1979, the Segue Foundation published Roof magazine. Between February 1978 and October 1981, Charles Bernstein and Bruce Andrews edited and published L=A=N=G=U=A=G=E magazine. The Segue Foundation was an indispensable vehicle for distributing Language Writing. Ted Greenwald and Charles Bernstein initially founded the Segue series in 1978 at the Ear Inn (the James Brown House), one of the oldest operating drinking establishments in New York City, on Spring Street. The series has been run by the Segue Foundation and coordinated by James Sherry since 1981. The series briefly migrated to the HERE Cafe in 1998 before moving to (the now-closed) Double Happiness on 173 Mott Street, where it stayed until 2001. In 2002, the series once again moved, this time to the Bowery Poetry Club on 308 Bowery where it remained for ten years. Since 2012, the Zinc Bar on 82 West and 3rd has hosted the series on Saturday afternoons. The Segue Foundation funds and organizes the readings using a changing roster of curators. So who are our actors in this network? We get the following figures based on the data scraped from the PennSound website. In themselves, these figures don’t suggest a lot since the PennSound holdings of the series is incomplete. I’m somewhat hesitant to focus on fixed categorization, although I also arbitrarily identified the gender of names, rather than the poets, which potentially masks nonbinary and trans poets, who have also participated in the series. In the Ear Inn Series, I could comfortably identify 127 instances of female hosts and 131 male hosts. (Each instance in this case refers to a unique reading. That is to say, I identified 127 times in which the reading was preceded by a female organizer and/or introducer.) Introductions at the Ear Inn averaged seventy seconds, although again this figure is misleading. Introductions were not always recorded and those that were documented sometimes began in media res with several recordings capturing only the last three seconds of the induction. Whether the duration of introductions have increased or decreased over the lifespan of the series remains to be seen, although prima facie,gender had no bearing on the length of the introductions at the Ear Inn. 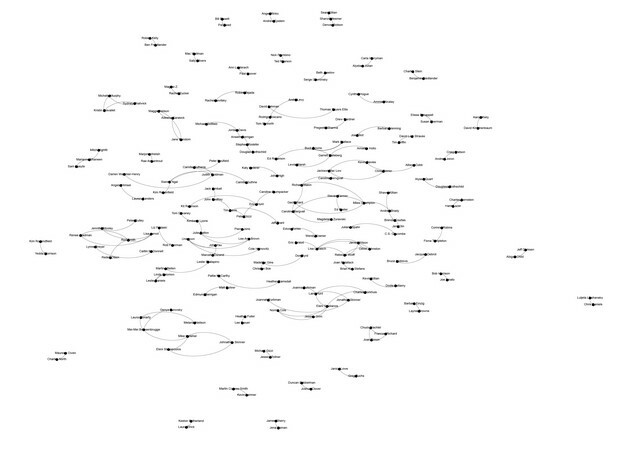 To undertake this research, I used a program called Gephi to map the Segue series poetry community (figure 1). Figure 2. Segue series at the Ear Inn page on PennSound. So what do these maps tell us? Ignoring the ‘unknowns,’ the maps for the Ear Inn and the Bowery Project Club appear to show a number of radiating connections at first glance. While Double Happiness and Zinc illustrate more unique pairings with smaller overlaps between individual readers. In the Ear Inn series, Bruce Andrews was the most frequent male performer (with 16 readings), followed by Charles Bernstein (9), James Sherry (7), Jackson Mac Low (7), and Alan Davies (6). Fiona Templeton was the most frequent female performer (6) with Melanie Neilson, Hannah Weiner, Diane Ward, and Abigail Child following equally close behind her (5). For comparison, performers at the Zinc Bar have read either once or twice, but the series has also been running for a considerably shorter time at its present location. 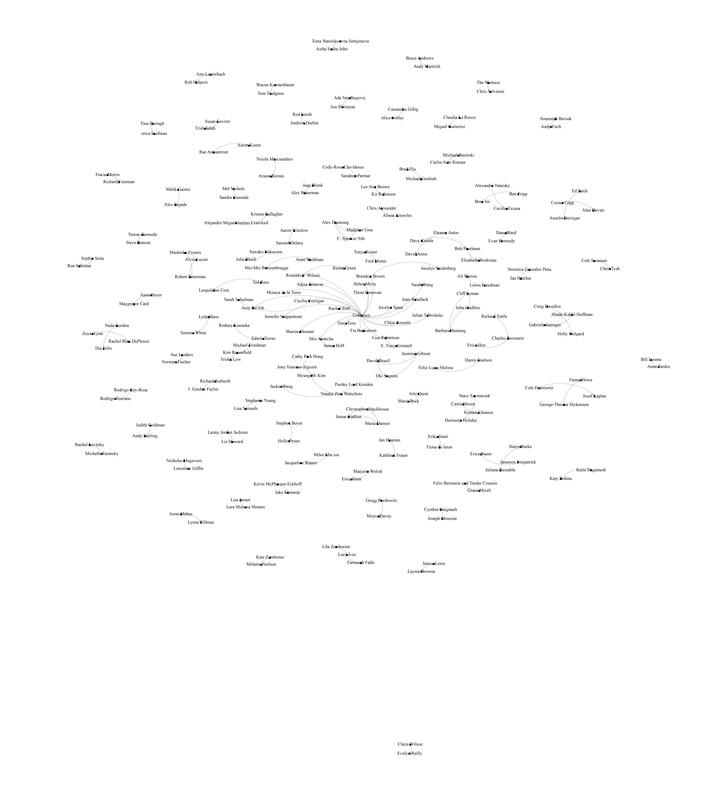 A possible next step would be to look more distantly at these networks in the PennSound archive, to assess and weight the weak and strong ties in poetry community and how they are rendered visible in the poetry series. This possible next step leads me to the following point. I’d prefer not to read too much into these maps, without considering other variables involved, although they do allow me to ruminate whether we can revisit Robert Creeley’s idea of ‘company.’ In an interview with Mông-Lan, Creeley suggested that “poets generally collect as various “groups” or company whereas novelists — while they may share techniques or general effects — are seemingly much more singular.” Thinking more generally, I wonder to what extent we might revisit the early iteration of Segue series, with its origins in the L=A=N=G=U=A=G=E milieu, as a company that has now shifted into a dynamic community with sprawling weak ties when the series became iterant. Over the next year, I intend to expand my proof-of-concept to include other reading series such as the Belladonna Series, St Mark’s, and SUNY-Buffalo Wednesdays @ 4 Plus and Walking the Dog to identify the nomadic poetic cartographies on the Northeast. What, for example, would it mean to consider the mobility of poets into new environments? How nomadic are performances? Can poems travel in other ways outside of print or web distribution? 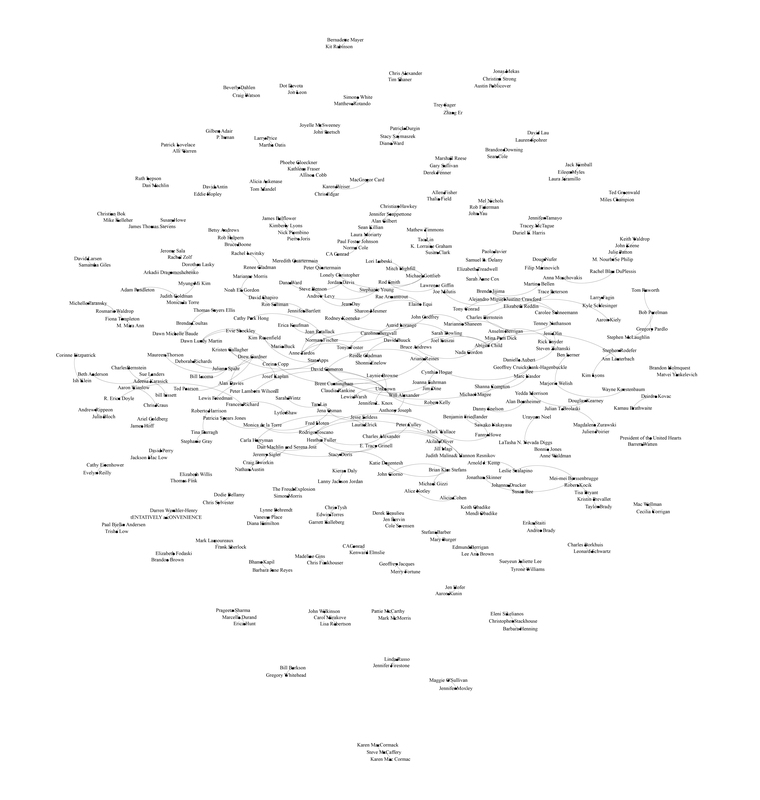 By mapping these series, I hope to build a better picture of the possible relationships between readers, based on the information available in the PennSound archive. More to the point, expanding this project will grant me the opportunity to critically tighten the questions that sparked my initial inquiry. I am indebted to the support of the Price Lab for Digital Humanities, Stewart Varner, Al Filreis, and Chris Mustazza for making this research possible. I also wish to thank James Sherry for his advice on the paragraph dealing with the history of the Segue Foundation. I welcome any commentary and advice on this project at orchid(at)sas(dot)upenn(dot)edu. Al Filreis, “Notes on Paraphonotextuality,” Amodern4: The Poetry Series, March 2015, accessed February 2, 2018. I will delay close analysis on this epistolary address for another time, but I wish to acknowledge and thank Daisy Atterbury for providing additional context for it. Force Atlas2 is also the default algorithm for Gephi that gives a generic view of the connections between data. For more information, see Mathieu Jacomy, Tommaso Venutrini, Sebastien Heymann, and Mathieu Bastion, “Force Atlas2, a Continuous Graph Layout Algorithm for Handy Network Visualization Designed for the Gephi Software,” Plos One, June 10, 2014, accessed March 1, 2018, https://doi.org/10.1371/journal.pone.0098679. To reiterate, these figures are derived from the available listings on PennSound, not from the Segue archives. See Mông-Lan, “An Interview with Robert Creeley,” University of Arizona Poetry Center Newsletter 25, no. 1, (Fall 1999), accessed March 1, 2018. Robert Creeley, “The Company,” The Collected Poems of Robert Creeley 1975–2005 (Berkeley: U of California P., 2006): 304.